I don’t know if you’ve been reading along or not, but, sometimes, my life is just a little crazy (see, for example, the cake that wasn’t, the kid in the padded room and other fun stories from my life). So, I do some really intense therapy on a daily basis. REALLY intense. I call it “food therapy” (LOL!). I make comfort food. And because my life is nuts, I tend to go with super-easy meals that can be made either with a baby on your hip and a toddler on your ankle or in the 15 minutes my husband can wrestle those two before they insist on being on top of me again. 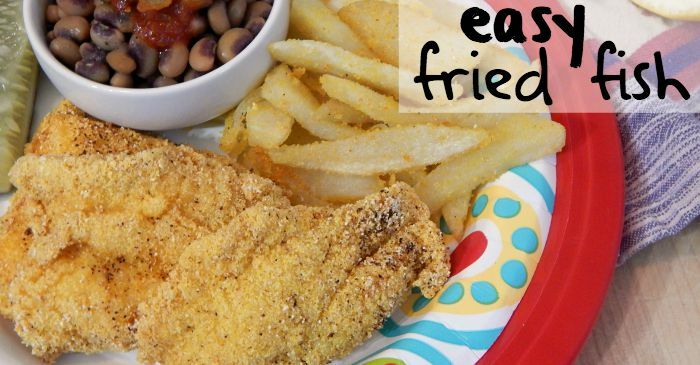 Easy Fried Fish is one of those go-to meals I make when one of these evenings gets particularly crazy and I need a little comforting on my plate. Place the frying oil in a large pot, or pan with tall sides, over medium heat. 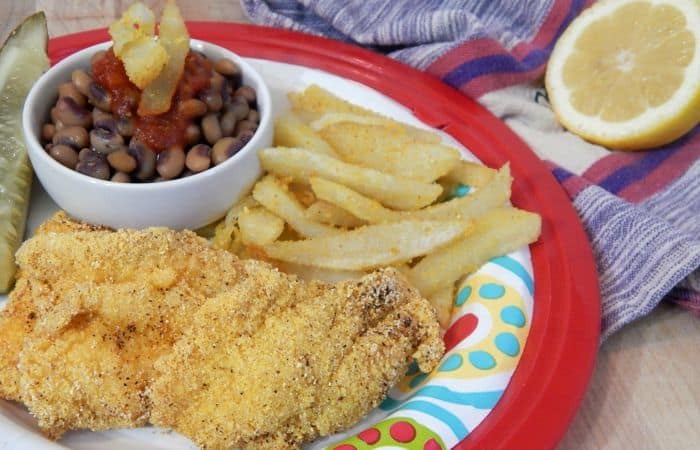 Rinse catfish fillets in cool water and set on a plate over paper towels to drain. While the the fillets are draining, place garlic powder, salt, pepper, corn meal and onion powder in a gallon-size ziplock baggie. When the oil is hot (which you can check by tossing a pinch of cornmeal in the oil and if it sizzles, it’s hot), take one fillet at a time and put it in the cornmeal mixture, shaking the bag gently until all parts of the fillet are covered. Shake off any excess cornmeal mix. Place the fillet in the frying pan carefully. Add more fillets for a single layer in the pan. Checking back on the first fillet, flip it when the bottom side is stiff and golden brown (approximately 5 minutes). Remove fillets from oil and dry over paper towels. Repeat until all fillets are cooked. Eat with lemon juice sprinkled over it or with ketchup, or both if you dare. 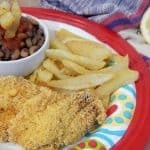 Easy Fried Fish is one of those go-to meals I make when one of these evenings gets particularly crazy and I need a little comforting on my plate.